This is the Lyonshel® Big Cat Face. This prosthetic mask was made to fit most faces. Like other Lyonshel® masks, this piece is only available in hot foam latex. Visit our FAQ for information about hot foam latex. 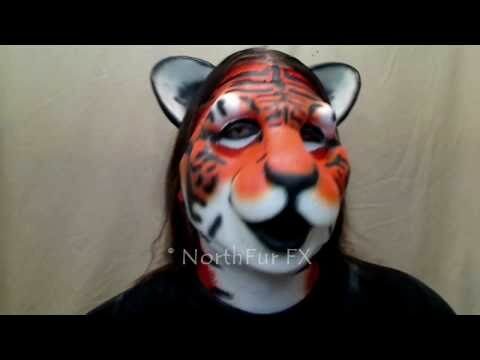 This Lyonshel® Big Cat Face is a full face piece, it has an attached brow and extends far onto the face compared to our own nose-only cat prosthetics. It has a big muzzle with a smile and attached lower jaw. It can be finished as any cat including housecats or larger jungle cats such as tigers, cougars, lions, leopards and more. It is one piece and comes unpainted by default. Teeth, contact lenses, ears and other prosthetic pieces other than the Lyonshel® Big Cat Face that are shown are not included. Using these types of costume accessories can help accentuate this prosthetic piece's feline features.